Attractive flower-filled courtyard beyond garden gate, summer kitchen, swimming pool with open views. 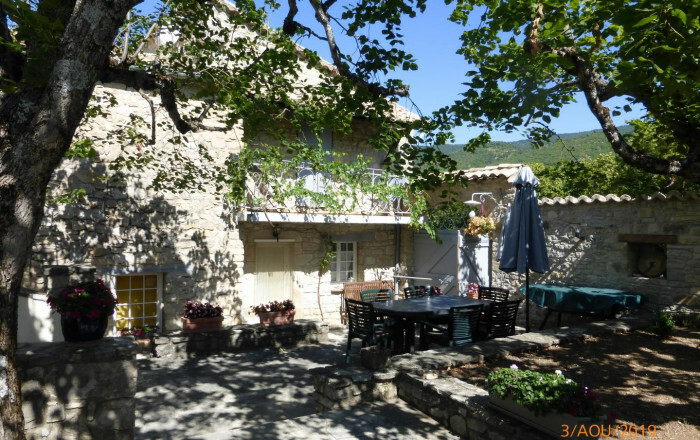 In south-east of the DrÃ´me ProvenÃ§ale, near the Hautes-Alpes department, Montguers is a typical little ProvenÃ§al village with lavender fields, a peaceful setting and forty permanent residents. In upper OuvÃ¨ze valley in Les Baronnies ProvenÃ§ales Regional Nature park, 20 minutes from Buis-les-Baronnies and Montbrun-les-Bains - outstanding sites with a rich historical heritage. Don't miss the Route du Col de Perty with its panoramic views of the Mont Ventoux (also called the GÃ©ant de Provence) and the mountains of the Hautes-Alpes. The Maison de ZoÃ©, adjoining owners' home, has separate entrance and private outdoor area. Ground floor: living room, kitchen, utility room, shower room, WC. 1st floor: 2 bedrooms - one with balcony (double bed) (2 single beds). Private swimming pool open mid-June to mid-September.